One of the things we’ve been enjoying lately with Dylan is trying new foods. He’s always happy to try new foods and most of the time he likes whatever we give him. The holidays have actually helped us branch out a little bit more because when we’ve been at restaurants or family get togethers, we’ll smash up some fruit, veggies or even bread and let him try them. The other thing to know here is that, while we were told 4 months ago that his gums were swollen so a tooth could be coming any day now, he still has no teeth. 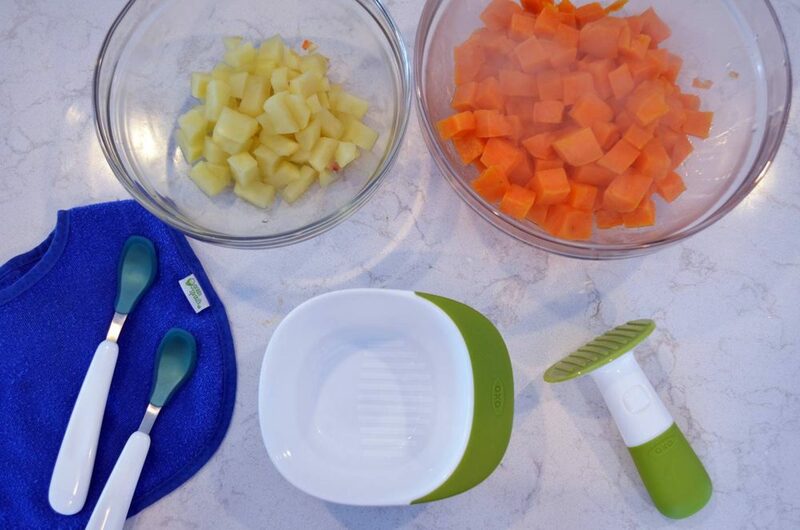 Not too long ago, I got a few things from OXO Tot for preparing baby food at home, including this masher and these storage cubes. Dylan has liked the combination baby foods that we purchase, so I’ve tried to make a couple of combinations on my own. We’re big sweet potato fans and almost always have them around for dinners or in breakfast tacos (they’re so good mixed up with chorizo and egg), so it was very natural to start with those as a base for Dylan’s food too. I wanted to combine a fruit and vegetable, so I chose red apples. We’ve always had good luck on first time combinations when they’re on the sweeter side, so I knew this one would be a winner. Finally, I added a small pinch of cinnamon for a bit more flavor. I felt comfortable adding a bit of seasoning because we have a couple of store-bought foods that have cinnamon in there. 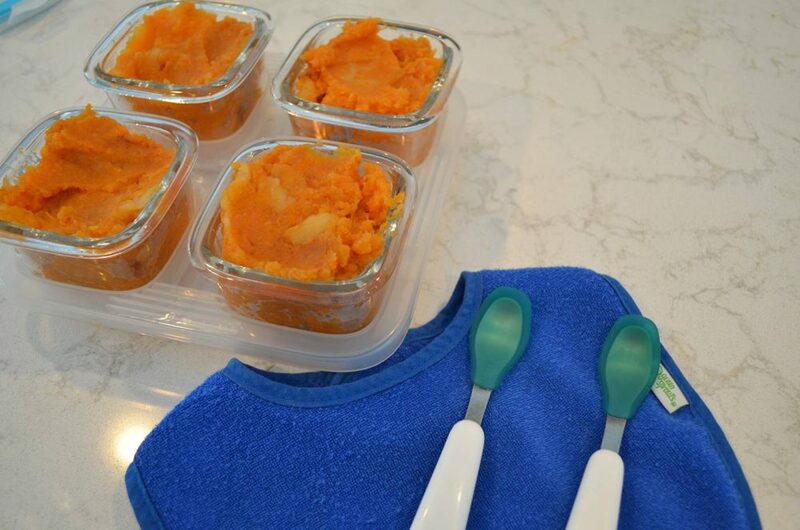 Peel and chop sweet potato (2) and red apple (1) into 1/2″ cubes. 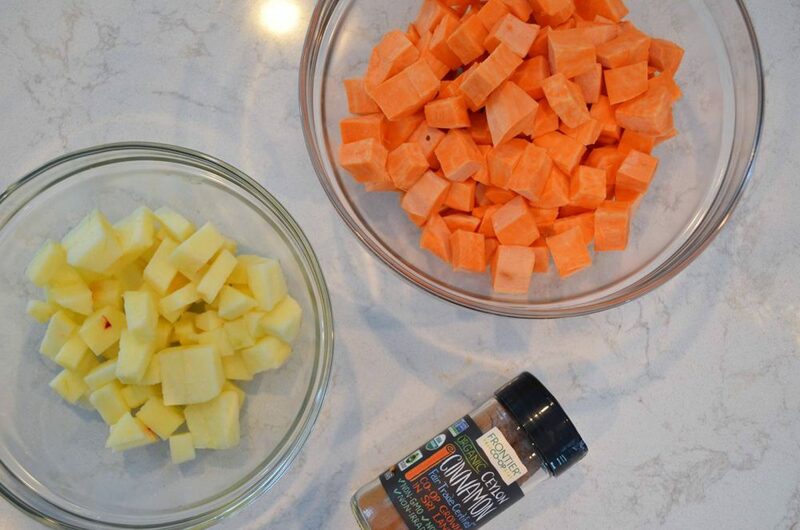 For sweet potato: put cubes in pot and cover with water, bring to a boil and cook for approximately 15 minutes. Drain both ingredients and allow to cool slightly. Continue mashing until food is at desired consistency and then stir 1/2 teaspoon of cinnamon into entire mixture. 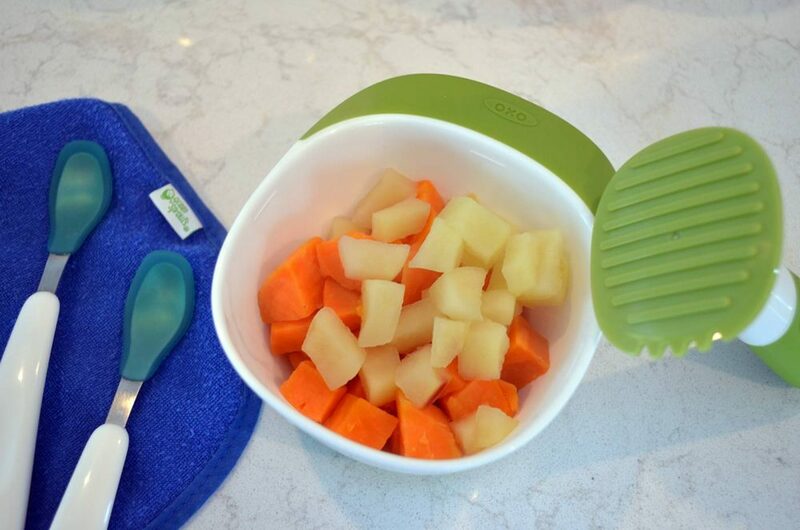 The OXO Tot Feeding Spoon Set with Soft Silicone that Dylan uses are his absolute favorite. I had two that I bought for Jackson 4 years ago and those were the only ones that Dylan would eat off of (even though I did buy different ones for him). We’ve bought more since then because they’re clearly the best and that made me even more excited when OXO Tot sent us another set! I am going to continue to use the OXO Tot Glass Baby Blocks long after we are done with baby food. They are such good quality and are so nice that I’ll use them for sauce or snacks – maybe even just for me! Thanks to OXO Tot for partnering on this post.